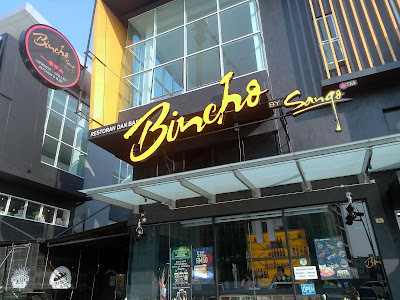 Special thanks to Bincho By Sango for extending this food review invitation. Bincho By Sango is the latest addition to the Sango Group of Restaurants. 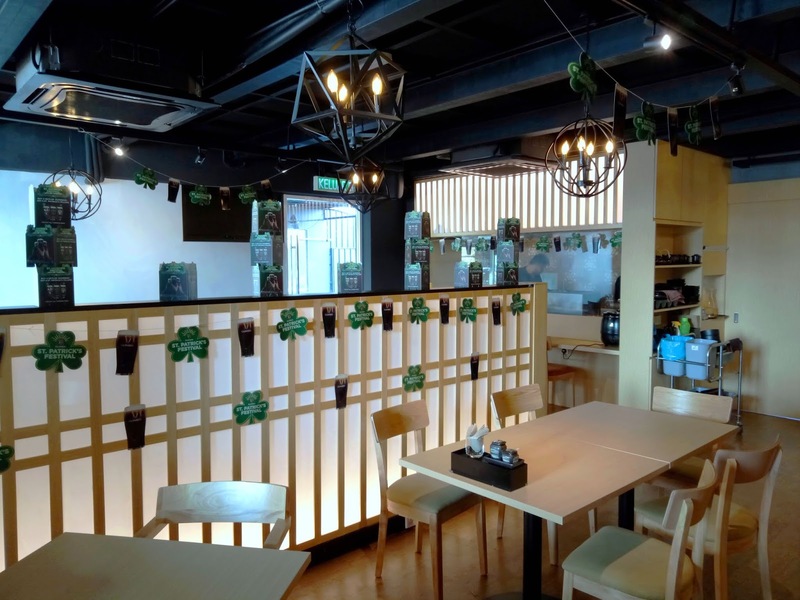 The group's flagship restaurant is Sango Japanese Restaurant (珊瑚日本料理), which is located inside Crystal Crown Hotel in Petaling Jaya. 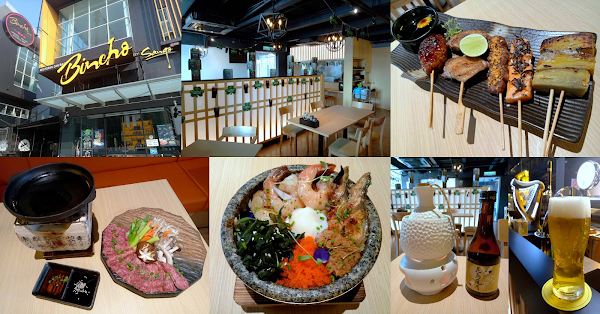 Meanwhile, this outlet at Sentral Jaya is the group's izakaya spin-off. An izakaya (居酒屋) is the Japanese equivalent of a pub. In Japan, such drinking establishments are frequented by office workers after work. Besides alcoholic beverages, an izakaya typically serves light meals too. 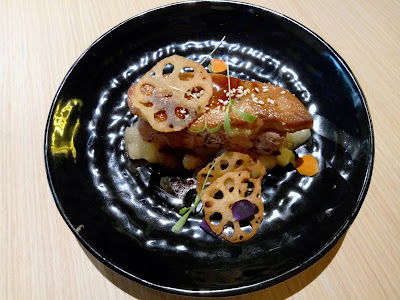 Bincho takes a step further by offering japas, a fusion of Spanish tapas and Japanese cuisine. 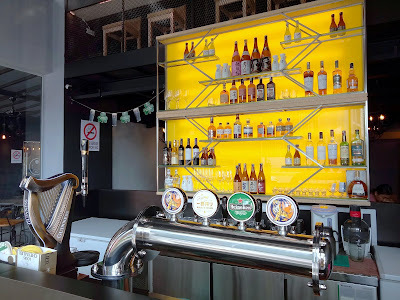 The bar near the entrance is where alcoholic beverages like beer, wine and liquor are prepared. Most drinks are served by the bottle, but certain types are also poured by the glass. 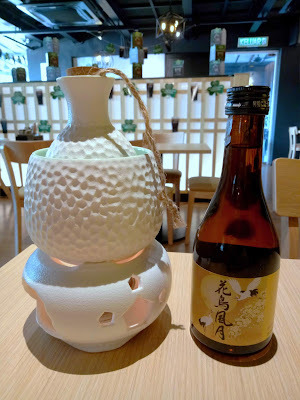 As a Japanese drinking establishment, Bincho also carries several popular sake (酒, Japanese rice wine) and shochu (焼酎, Japanese liquor) brands. Sake can be served chilled (冷酒), at room temperature (常温) or heated (熱燗). Hot sake is customarily consumed during winter. Although some flavors may be lost, the wine's aroma plays a more prominent role. Sake is poured into a ceramic flask called tokkuri (徳利), where it is heated by hot water. This 300 ml bottle of Kacho Fugetsu (花鳥風月, RM68.00) contains approximately 14% alcohol by volume. In addition, Bincho offers several brands of draft beer like Guinness, Heineken and Tiger. 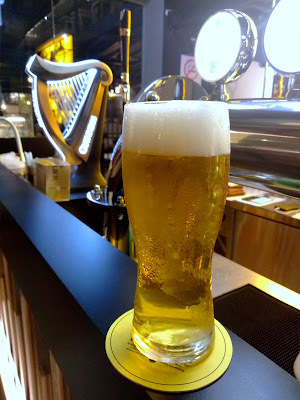 Our choice this evening is Kirin Ichiban (一番搾り, RM12.00), one of the most popular beers in Japan. With a frothy head, the beer tastes remarkably fresh and smooth. It is served in a frosty glass to keep the drink chilled as long as possible. Alcoholic beverages go particularly well with kushiyaki (串焼き). 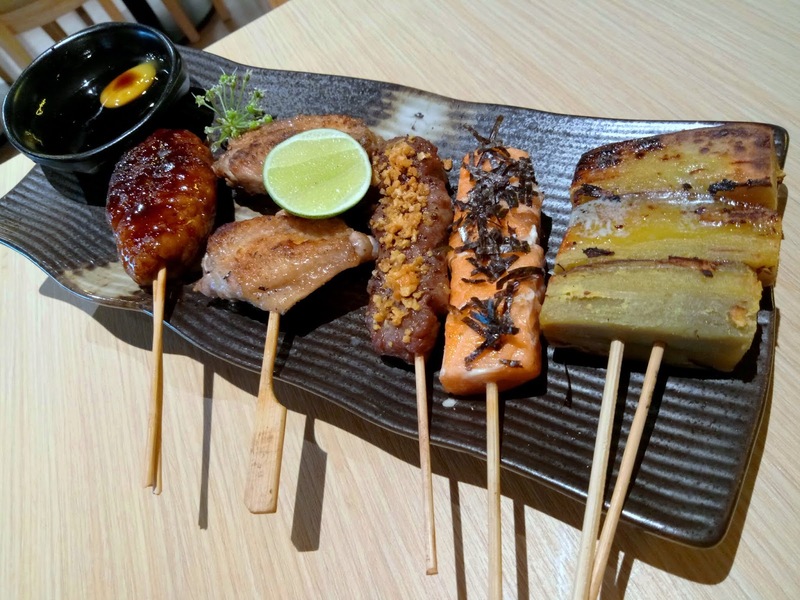 Sango Signature Platter (RM49.00) allows diners to savor multiple crowd favorites at a time. The platter consists of tsukune (つくね, chicken meatballs), chicken wings, wagyu cubes, salmon cubes and sweet potatoes. 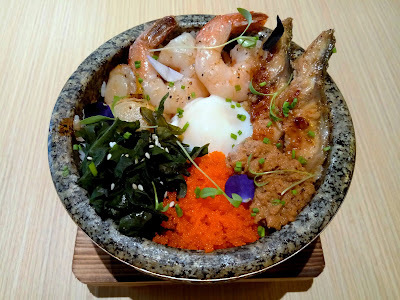 Sweet-savory tare sauce and quail egg are provided too. Creamy Baked Oysters (RM25.00) are presented over a bed of coarse salt crystals. They are each gratinéed with mentaiko (明太子, spicy roe) and mayonnaise. 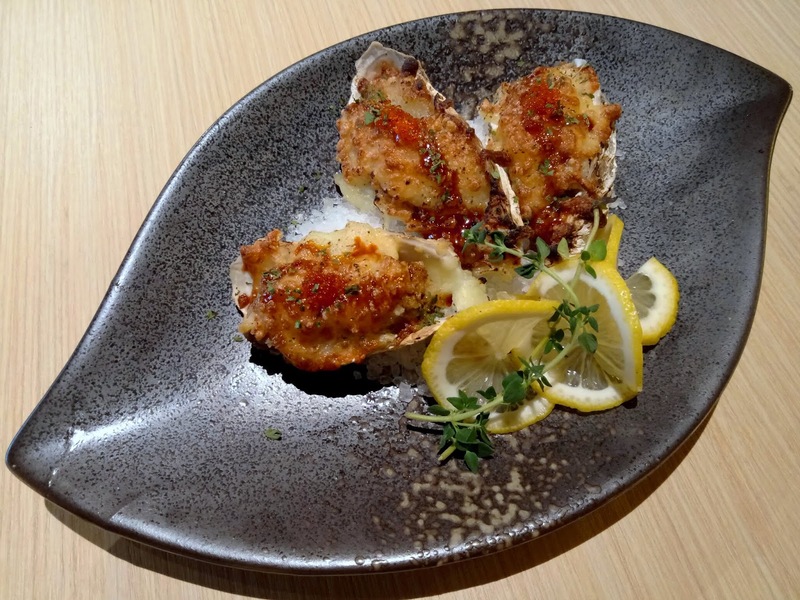 Like most izakaya food items, the oysters are heavily seasoned in order to complement alcoholic beverages. Their creamy texture is satisfying indeed. The next dish is Bonded Unagi & Foie Gras (RM35.00). 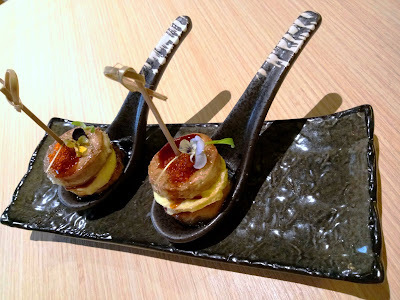 This japas cleverly combines the unique flavors and textures of foie gras, unagi (うなぎ, freshwater eel) and fried egg. Flavored with tare sauce, each bite-size piece is elegantly presented on a ceramic spoon. I am particularly fond of the buttery texture of foie gras as it melts in my mouth. Seared Blue Fin Tuna With Foie Gras (RM36.00) is another similar dish. In this case, foie gras is served over bluefin tuna, unagi and apple chutney. Tare sauce is added for extra flavor. The dish is garnished with thin slices of fried lotus, whose crispiness really enhances the overall texture. I am quite impressed with this delicacy. For something more filling, Hot Stone Bowl Rice (RM35.00) is topped with seafood ingredients like unagi, scallops, shrimps, tobiko (とびこ, fish roe) and seaweed (ワカメ). It also comes with onsen tamago (温泉玉子, hot spring egg), minced chicken and tare sauce. Mix the ingredients thoroughly before consuming. Be extra careful with the stone bowl because it is scorching hot. 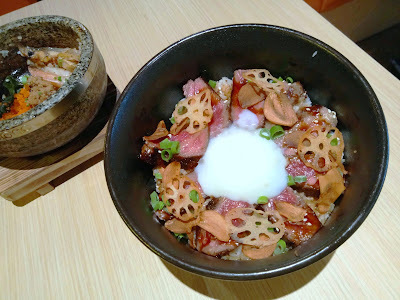 Truffled Wagyu Donburi (RM35.00) is my favorite dish this evening. This gratifying delicacy contains succulent slices of wagyu beef. Beef is cooked medium rare in order to allow diners to appreciate its premium quality. Besides onsen tamago and tare sauce, truffle oil is also added to elevate aroma to a whole new level. Last but not least, fried garlic serves as icing on the cake. 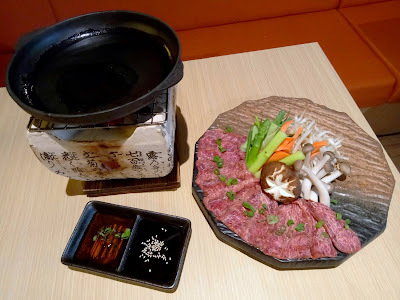 Tobanyaki (陶板焼き, RM65.00) features a serving of premium wagyu beef with fine marbling. The thin slices of beef are to be grilled on a hot ceramic plate, which is heated by burning charcoal below. This exquisite delicacy also comes with shiitake mushrooms, shimeji mushrooms, bean sprouts and asparagus. Spicy garlic sauce is provided. 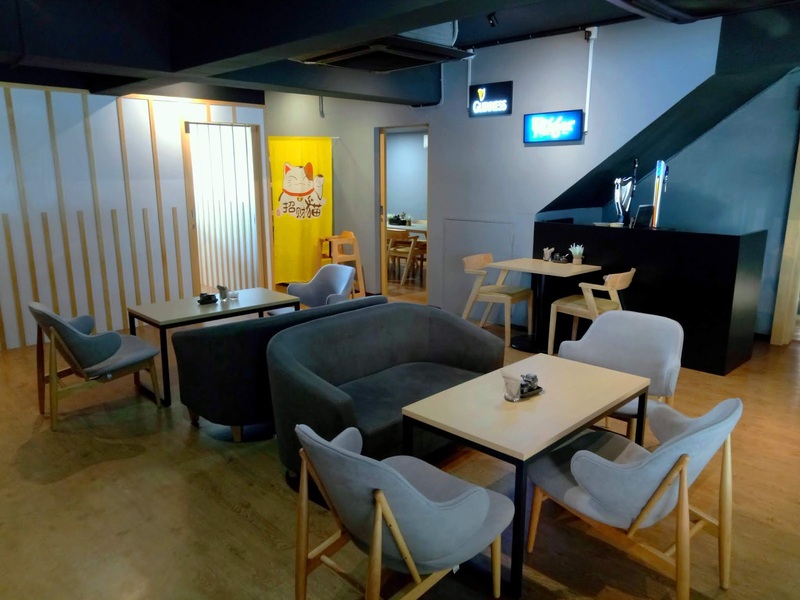 Thanks to dim lighting and light music in the background, Bincho presents a relaxing yet lively ambience for casual drinking. In case the main dining area is fully occupied, the izakaya establishment has extra dining tables upstairs. In addition, Bincho provides two private rooms that can accommodate up to 10 people each. Directions: From the North-South Expressway, take the Bukit Mertajam exit and head east. Make a U-turn at the next traffic lights. Turn left into Sentral Jaya. Bincho is near the center of the row of shops. There are parking spaces in front and the back of the restaurant.